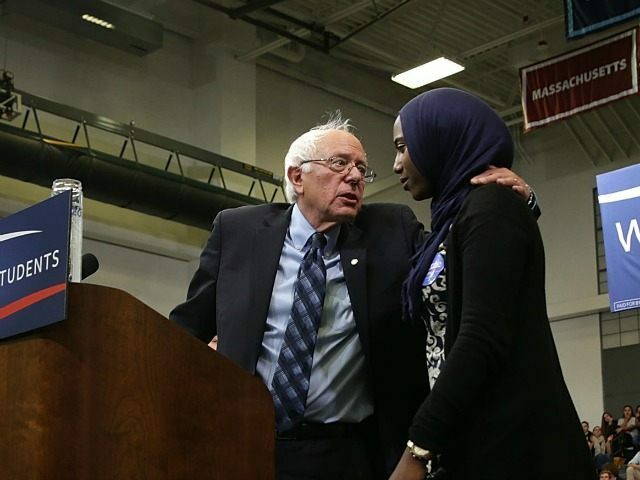 The Sudanese Muslim immigrant who persuaded Democratic presidential candidate Bernie Sanders to denounce criticism of Islam as “racism,” has a history of supporting Muslim fundamentalists and of participating in hard-edged anti-Israel protests. “If we stand for anything we have to stand together and end all forms of racism in this country. I will lead that effort as president,” Sanders answered when questioned by Remaz Abdelgader, a Sudanese immigrant. “Our job is to build a nation in which we all stand together,” said the the Democratic nominee, who hugged the Islamist. Sanders gave his answer after Abdelgader asked him to denounce Dr. Ben Carson’s and Donald Trump’s recent criticism of Islamic ideology. “With the growing Islamophobia in this country, if you look at all the Republican candidates, in order to get, in order to feed into their constituents, they’re talking about Islamophobia and they’re constantly bashing Muslims in the media,” she said, adding that Trump and Carson, the two Republican frontrunners, are the “biggest bigots” against Muslims. Abdelgader’s statement was likely prompted by Carson’s recent comment that he could not support a Muslim candidate for president who supports Sharia law. But Carson also said he could support a Muslim candidate if they chose to obey the Constitution over the Koran. When asked about a new British measure to suppress violent Islam, Trump recently pledged to “look into” mosques that incite terror. There is no evidence that the comments about Islam’s ideology by Carson and Trump were motivated by racism, partly because Islam’s believers include Asians, blacks, Latinos and whites. However, Abdelgader’s Islamist views may prove embarrassing for Sanders, who is Jewish. Abdelgader has called for Israel’s destruction. During Hamas’ 2014 rocket-and-tunnel war on Israelis, Abdelgader attended an anti-Israel rally in front of the White House, where attendees displayed pro-Palestinian signs and repeated an anti-Jewish chant, “From the River To The Sea, Palestine Will Be Free.” The cheer calls for the annihilation of Israel. She posted the text on her Instagram page. The fate of the Jews living in Israel is not explained. 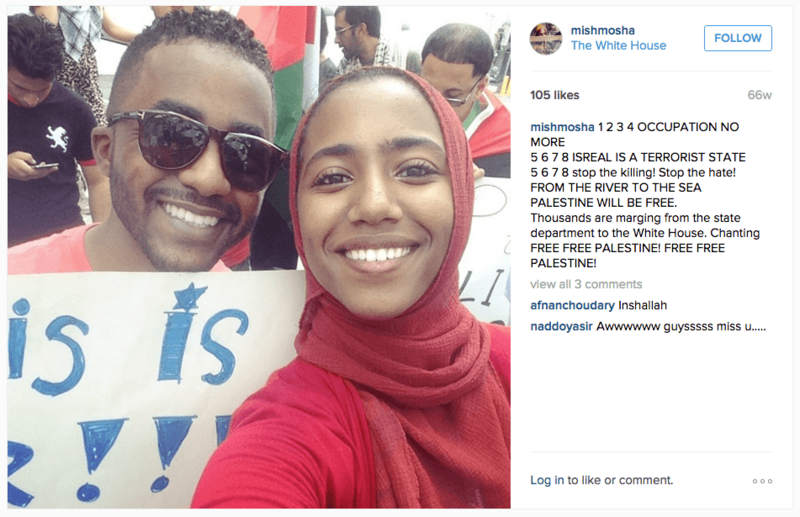 Abdelgader documented the anti-Israel rally on her Instagram page, calling “Isreal” a “terrorist state,” and expressing her disappointment with President Obama. She participated in some of the chanting according to a video posted at her Instagram site. 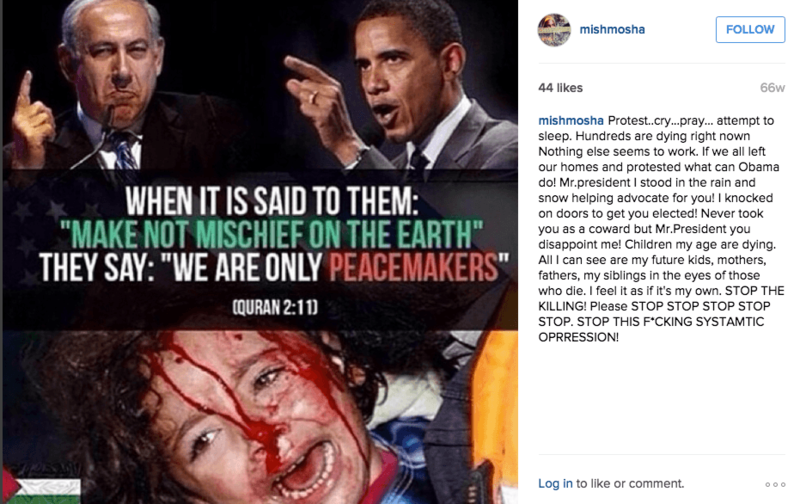 She also posted photo of a collage of Obama and Israeli Prime Minister Netanyahu above a bleeding child. In June 2012, Abdelgader applauded the Muslim Brotherhood’s Islamist takeover of Egypt. 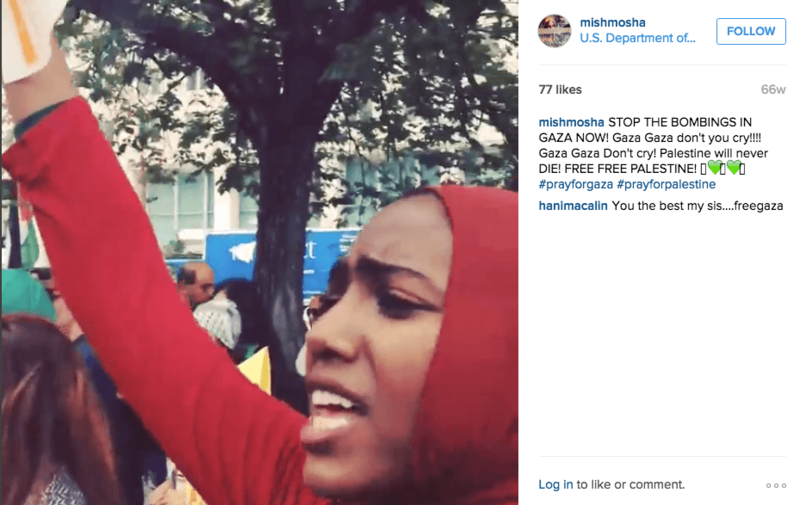 She also posted an anti-Israel image from Linda Sarsour, a hard-line Islamist advocate against Israel. 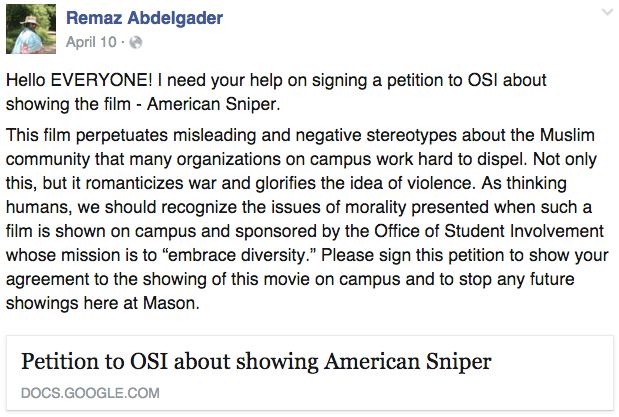 In April, she tried to win signatures for a petition against the showing of the popular “American Sniper” movie at her university. “What should have been an unremarkable statement against racism was made noteworthy because only a handful of presidential candidates have gone on the record to denounce Islamophobia,” commented Robert McCaw, CAIR’s government affairs manager. Nonetheless, on Thursday. the advocate for Israel’s destruction accomplished her goal: getting Sanders on the record to denounce the supposed anti-Muslim sentiment in America, which won him praise from Islamist groups in America. U.S. progressive outlets, including ThinkProgress.org, also applauded her efforts. Abdelgadar also told Sanders that she is unhappy that she can’t run for the White House. But it appears the U.S. Constitution does prohibit Abdelgader from becoming President of the United States. 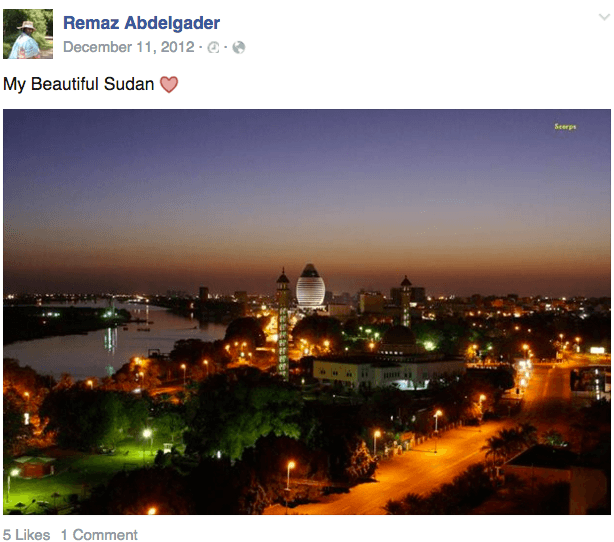 According to her Facebook profile, Abdelgader was born in Khartoum, Sudan. Her parents are Sudanese who later won asylum in the United States. Abdeldar still has strong emotional ties to Sudan. The nation remains today a theocracy and is ruled by a dictator who has been charged with war-crimes for attempted genocide against non-Muslim Africans in the south of the country.